Doctors Without Borders Says Levels Of Malnutrition Are At Catastropic Level In Northeastern Nigeria : Goats and Soda The number of malnourished people in northeastern Nigeria could be as hlgh as half a million. Boko Haram shoulders much of the blame. Two-year-old Sakina is suffering from acute malnutrition. After weeks of intensive feeding therapy at a Doctors Without Borders center, she's heading back home, amid concern whether there'll be enough food to keep her from returning to the unit. Wide-eyed Sakina Muhammad, who's 2, sits on the lap of her mother, Habiba, on a bed in the ICU. Sakina is stick thin, her body withered and emaciated. Thousands of these displaced people live in precarious conditions at an informal settlement called Muna outside Maiduguri, the capital of troubled Borno State and birthplace of Boko Haram. They were driven from their homes after attacks by the Islamist militant group. And right now it's the rainy season, which means lean farming. So there's no harvest. Muna is a sea of flimsy, makeshift shelters, covered in plastic sheeting. It stretches out for acres, with virtually no trees, facilities or amenities in sight for more than 13,000 displaced people. Displaced women at the Muna informal settlement outside Maiduguri. 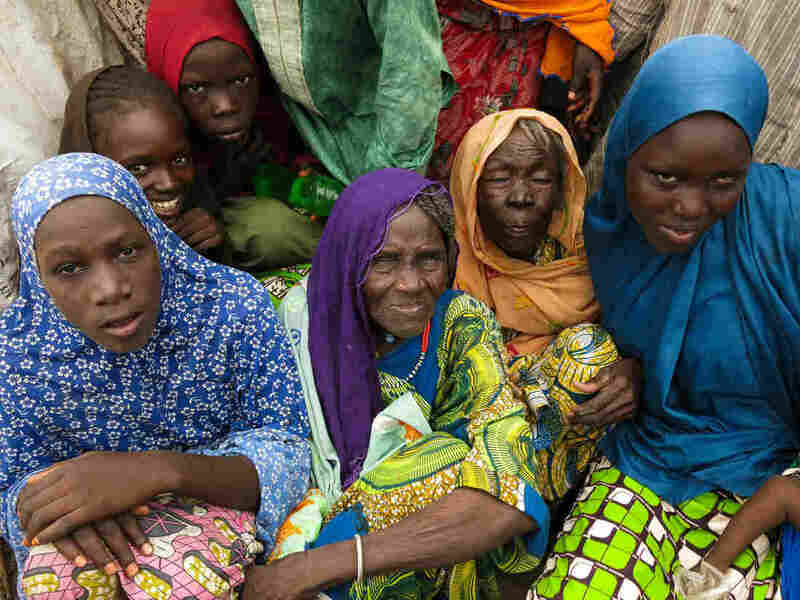 They're among more than 2 million people driven from their homes by Boko Haram attacks during northeastern Nigeria's 7-year insurgency. It's one of a growing number of unofficial camps that have sprung up just off the main highway leading from the Maiduguri city to the Cameroon border, once no-go areas under Boko Haram's control. Militants from the ISIS-affiliated terror network declared a caliphate and held territory in this region until last year. It took a freshly-motivated and equipped Nigerian military, backed by troops from neighboring countries that have also been targeted by Boko Haram, to dislodge the insurgents. Nigerian human rights' defender, Hamsatu Allamin, has visited these unofficial tent camps. The regional head of Nigeria's Stability and Reconciliation Programme, she campaigns for an end to the Boko Haram conflict. She laments that the displaced are forced to "erect shanty shelters. I saw women who delivered [babies] inside shelters constructed with polythene bags." Allamin says Nigeria's northeast "rates lowest in all terms of human development indicators," including "poverty, hunger, disease, illiteracy and, most recently, malnutrition. "Name it, it all happens here," she says. Now Boko Haram has been chased out of Maiduguri, but the fallout from their reign of killing, destruction and intimidation continues. On Sunday, Nigeria's richest man, businessman Aliko Dangote, and global activist Bono visited camps in the northeast, where up to 2.5 million people displaced by the fighting have found shelter. Dangote warned, "If we don't rebuild their homes, their schools, their lives — 2 million people could actually become a danger to the world." Others, like the activist Allamin, have voiced similar concerns. Add to that the humanitarian crisis. Doctors Without Borders says a major emergency operation is needed in response to the malnutrition. Children especially desperately need food and medical care. During his visit, Bono told the BBC that the story of the malnutrition is simply not getting out. Kaltume Abubakar, displaced by Boko Haram fighting, cooks the evening meal for her family of four — son, daughter, husband and mother-in-law, outside her makeshift home at the informal Muna camp, near Maiduguri, northeastern Nigeria. 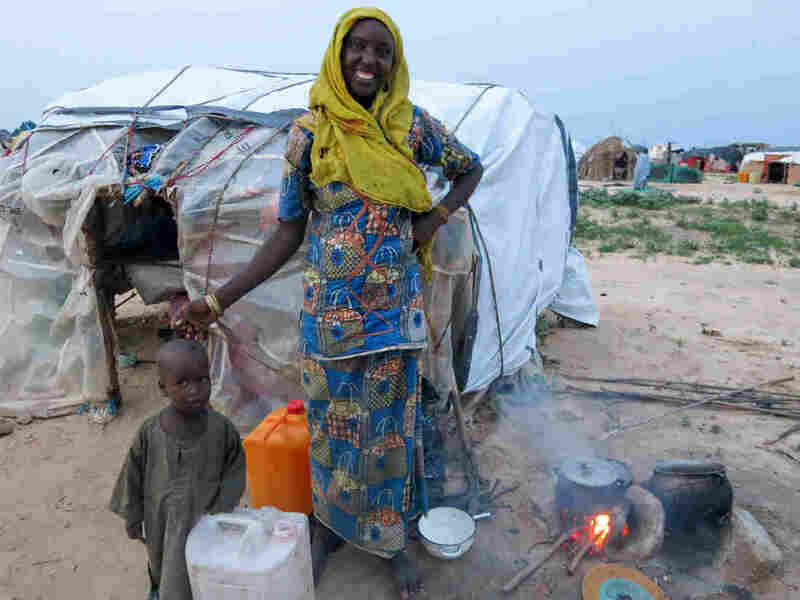 In the dying light of the evening at Muna camp, a flame flickers under the basic meal of the day Kaltume Abubakar is cooking outdoors over firewood for her family: a baby boy, a little girl, her husband and her mother-in-law. They've twice been displaced, she says, forced to leave their home in Bama because of Boko Haram attacks and fearful of more violence. And, she says, they're too frightened to go back. Standing outside their shelter, constructed of twigs and sheeting, Abubakar says the government is not taking care of them at the camp. "We are on our own," she says. "We have no jobs, we have little food and our husbands can't find work." Speaking in the local Kanuri language, she says it's tough being displaced. Her husband earns some money by carrying loads for people in the market. But he and other internally displaced people can't always count on finding work. On the day we visited Muna camp, UNICEF is seeing patients in two tented clinics it has erected in the grounds. 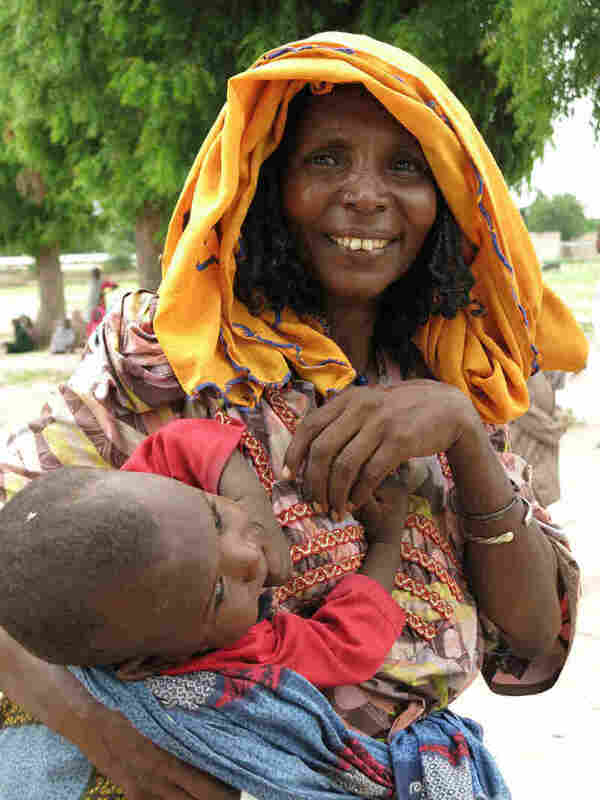 Workers refer the most acutely malnourished children to a therapeutic feeding center run by Doctors Without Borders about 15 miles away at Gwangeh. Dozens of mothers and their pin-thin babies and toddlers have gathered for screening, weighing and possible admission for the most severe malnutrition cases, like 2 year-old Zara Modu. 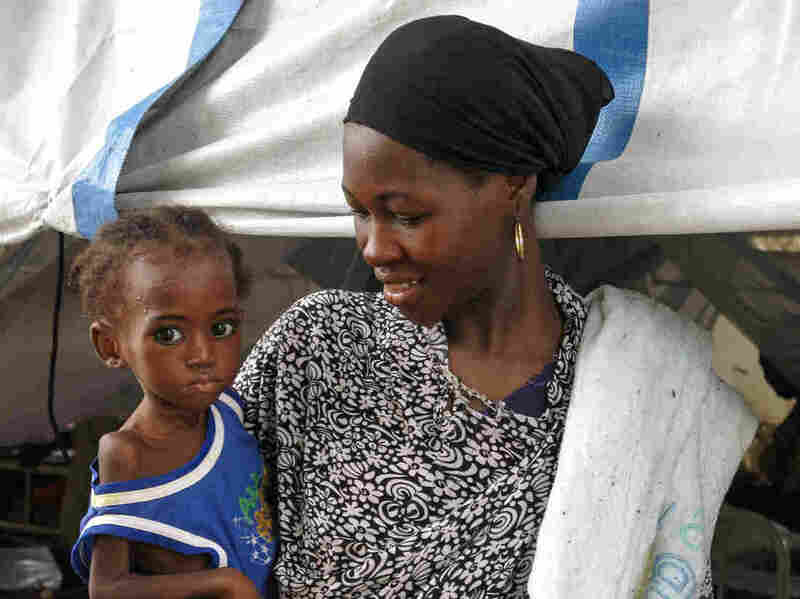 She's painfully thin with the classic symptoms of malnutrition — sunken eyes, diarrhea, swollen lower limbs — says senior nursing officer Yamamma Bukar, gently prodding the child's skin. There's hunger written on the children's faces. UNICEF says 2 million people in northeastern Nigeria need relief aid. But the U.N. group pulled its staff from hard-to-reach areas after Boko Haram militants ambushed a military-escorted humanitarian convoy in July. Doctors Without Borders has teams of doctors and nurses providing therapeutic feeding and round-the-clock care for sick children. The in-patient wards, including an intensive care facility, are all chockablock: more than 120 children on the day we visit, with two kids per bed plus their mothers and caregivers. "We are overstretched," says Dr. Pindar Wakawa, the medical activity manager at the unit. "Some of the patients we're not supposed to admit here but, because of the needs, we cannot turn them away." Malnourished children who are brought to the facility too late often die within the first 24 hours, says Jean Stowell, a nurse and medical team leader for Doctors Without Borders in the region. The Vermont native, who now lives in New Hampshire, has served in emergencies and crises all over the world, including earlier stints in Nigeria. She says malnourished babies and children who're admitted early stand a good chance of survival. The concern is, once they're discharged, without the food they need, they may be back. But there is still hope: "Some of the children are starting to cry — which is actually quite a good sign, that they are becoming a bit stronger," Stowell says. "The difference between a very weak cry and a healthier cry for us is quite a good sign." 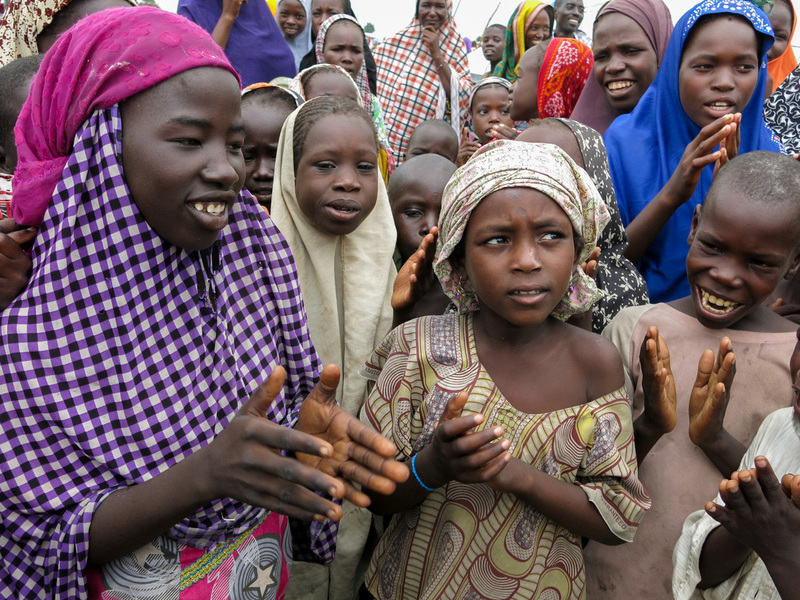 They're not in class, so to while away the time Maimuna Bundi, second from right, sings with her friends at Muna camp. Stowell walks us through the facility of wards and an ICU. She smiles at the family of 2-year-old Sakina Muhammad, who's made considerable progress since her admission weeks earlier. The little girl is clutching some dough and slowly takes tiny bites of bread. She's now able to eat solid food. But Sakina looks listless. The toddler barely responds to her mother's touch or smiles of encouragement, and the child herself does not smile. Habiba Muhammad, the mother, says, "I'm happy Sakina is getting better as the days go by. She's eating food now. She's eating bread. Her condition is getting better. We thank God."